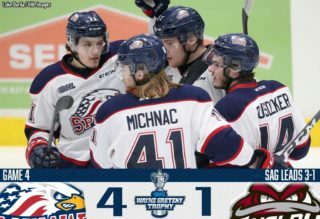 Saginaw, MI – The second-seeded Saginaw Spirit look to hold serve at home against the seventh-seed Sarnia Sting Saturday night, leading the best-of-seven series, 1-0. Puck drop is set for 7:05 p.m. at The Dow Event Center in Saginaw, Michigan. The Spirit defended home ice in game one of the OHL playoffs first round, 6-3 Thursday evening. Watch live on OHLLive.com or listen live on the flagship WSGW 100.5 FM and fmtalk1005.com with the voice of the Saginaw Spirit Joey Battaino and Dennis Desrosiers on the call. “Countdown to Faceoff” with host Domenic Papa starts 15 minutes prior to puck drop. Limited seating and standing-room tickets remain for tonight’s game. 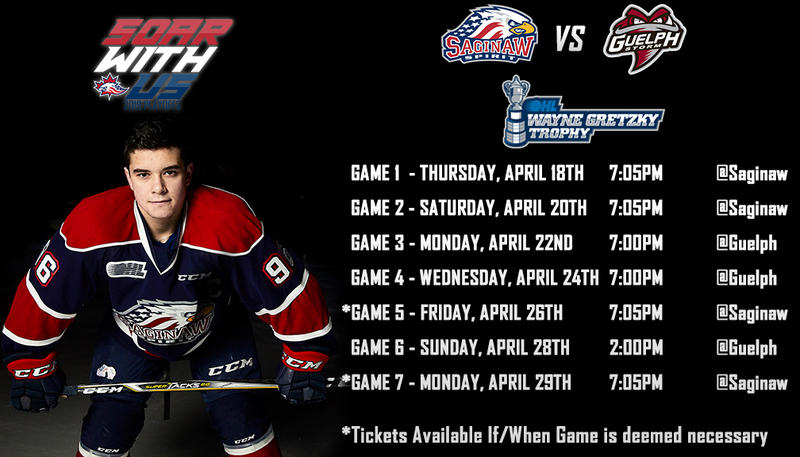 Call (989) 497-7747, visit saginawspirit.com, or by visiting the Saginaw Spirit Store at 5789 State Street, Saginaw, MI. 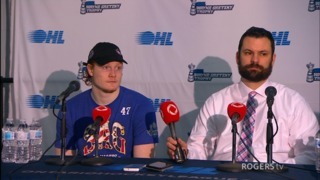 Saginaw head coach Chris Lazary was victorious in his first career Ontario Hockey League (OHL) playoff game. Lazary is a Coach of the Year contender after he led the Spirit to their second West Division championship in team history. Florida Panthers signee Owen Tippett led Saginaw with three points versus the Sting in game one. The Spirit right-winger scored two goals with an assist to collect the game’s first star. Tippett, the 2017 10th overall pick of the Panthers, led Spirit with 74 points in the regular season along with Cole Perfetti. 2018 Saginaw Spirit first round pick Perfetti collected a goal and assist in his first career OHL playoff game. The Spirit left-winger’s third period tally turned out to be the game winning goal. The OHL Rookie of the Year candidate led the Spirit in Goals (37) and Points (74) in the regular season. The Whitby, Ontario native was the OHL’s Rookie of the Month in February and March this season. 2018 New York Islanders 41st overall pick Bode Wilde was solid on the back end in the first game against Sarnia. The Saginaw defenseman contributed a goal and assist in game one. Wilde, a former University of Michigan commit, led the Spirit with 51 assists in the regular season. New York Islanders prospect Blade Jenkins scored his first career OHL post-season goal in game one. The Jackson, Michigan native’s early second period goal started the Saginaw comeback. The Spirit was stellar on the penalty kill and with the man-power advantage in game one. 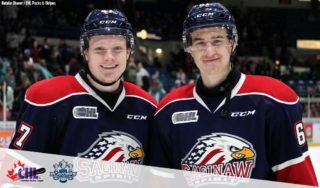 Saginaw’s captain Damien Giroux, along with Detroit Red Wings prospects Brady Gilmour and Reilly Webb, helped the Spirit kill all five Sarnia power plays. Saginaw was dangerous on both man-power advantages in game one. Perfetti’s game winner came on the second and final power play of the game. Sarnia’s main source of offense in game one came from left-winger Hugo Leufvenius. The Stockholm, Sweden native scored both first period goals for the Sting, along with an assist in the third period. Leufvenius was excellent against Saginaw in the regular season, with three goals and three assists. The forward was drafted in the first round by the Sting of the 2017 CHL Import Draft. Sarnia, Ontario native Franco Sproviero contributed three assists in the Thursday night match-up against Saginaw. The overager had three goals with an assist in five regular season games against the Spirit this season. Rookie Jacob Perreault collected his first OHL post-season point with an assist in game one. The Sarnia right-winger’s 30 regular season goals trailed only Perfetti among the OHL’s rookie goal scorers. Sarnia has two players with rights owned by NHL teams, forward Ryan McGregor (Toronto Maple Leafs) and defenseman Mitch Eliot (Vancouver Canucks).